Linda Benson "1997 Woman of the Year"
A native of Encinitas California, Linda Benson started surfing when she was 11 years old. She learned to surf at Moonlight Beach, where she'd wait until her brother, or one of his friends would lose a board and then she'd paddle it back out to him. At 13 her father let her buy her own, a beat-up old board that cost $20. At 5'2" and 105 pounds, Linda would prove a gutsy and talented athlete, dominating women's competitive surfing for over 10 years. 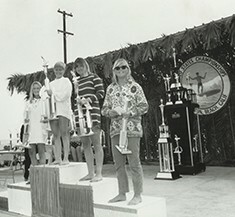 In 1959, at the age of 15, Linda became the youngest contestant ever to enter the International Championship at Makaha. She won. That same year she became the first woman to ride Waimea when she borrowed a board from the shortest guy surfing with her, paddled out and caught a couple of waves. Using the equipment of the early 50's, not to mention a goofyfoot in a time when most spots surfed were rights, she still managed to hold her own and gain respect for her fearless big wave riding and her ability to charge. 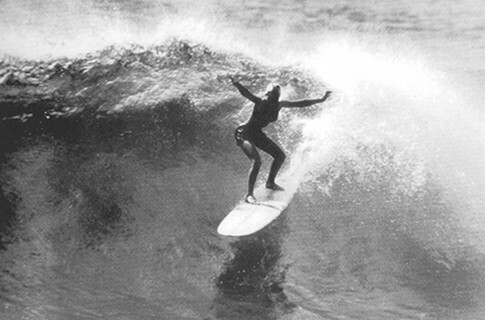 Linda went on to win the first U.S. Championship at Huntington Beach, in 1959, and continued to hold her title in 1960, '61, '64 and '68–setting the record for number of wins by a woman at that event. 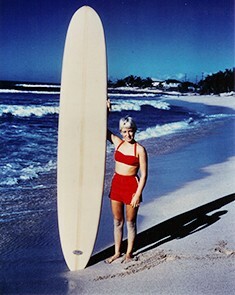 She tandem surfed with Don Hanson and Mike Doyle and was rated number one in a 1964 International Surfing magazine reader's poll. Linda also successfully competed in tandem events with Hobie Alter. Winning over 20 first place surfing titles from 1959 to 1969, Linda still found time to act as Annette Funicello's surfing double in the Beach Party films and as Deborah Walley's Surfing double in Gidget Goes Hawaiian. 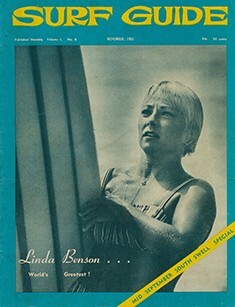 Linda also received a lot of publicity by surfing in John Severson's films. 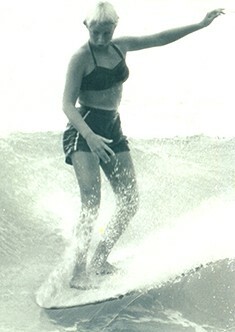 Linda has been inducted into both the Surfing Walk of Fame and the International Hall of Fame. On her Donald Takayama boards, she actively surfs today as well as participates in fundraisers and exhibitions. Over the last nine years, she has participated in the UCSD Cancer Center Luau and Longboard Invitational in LaJolla. She most recently participated in the legend exhibitions in Australia and Costa Rica.